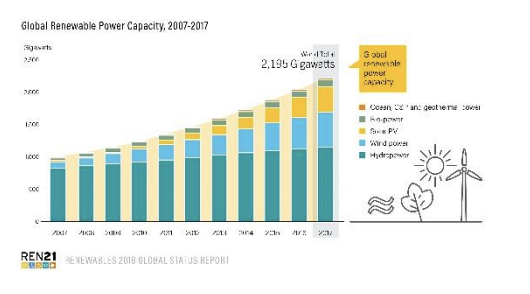 Transformation is picking up speed in the power sector, but urgent action is required in heating, cooling and transport 178 GW of renewable power added globally in 2017. 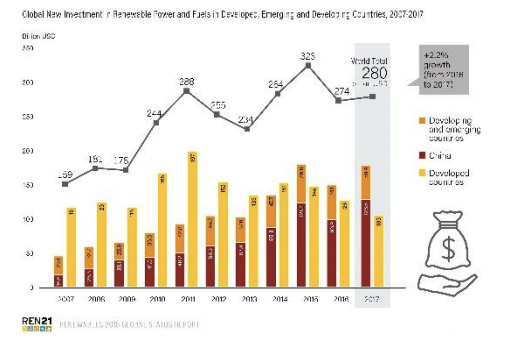 Renewable power accounted for 70% of net additions to global power generating capacity in 2017, the largest increase in renewable power capacity in modern history, according to REN21’s Renewables 2018 Global Status Report. But the heating, cooling and transport sectors – which together account for about four-fifths of global final energy demand – continue to lag far behind the power sector. The GSR is the most comprehensive annual overview of the state of renewable energy worldwide. New solar photovoltaic capacity reached record levels: Solar PV additions were up 29% relative to 2016, to 98 GW. 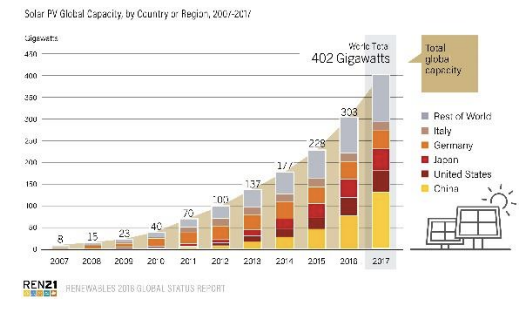 More solar PV generating capacity was added to the electricity system than net capacity additions of coal, natural gas and nuclear power combined. Wind power also drove the uptake of renewables with 52 GW. Investment in new renewable power capacity was more than twice that of net, new fossil fuel and nuclear power capacity combined, despite large, ongoing subsidies for fossil fuel generation. More than two-thirds of investments in power generation were in renewables in 2017, thanks to their increasing cost-competitiveness – and the share of renewables in the power sector is expected to only continue to rise. In the power sector, the transition to renewables is under way but is progressing more slowly than is possible or desirable. A commitment made under the 2015 Paris climate agreement to limit global temperature rise to “well below” 2 degrees Celsius above pre-industrial levels makes the nature of the challenge much clearer. If the world is to achieve the target set in the Paris agreement, then heating, cooling and transport will need to follow the same path as the power sector – and fast. 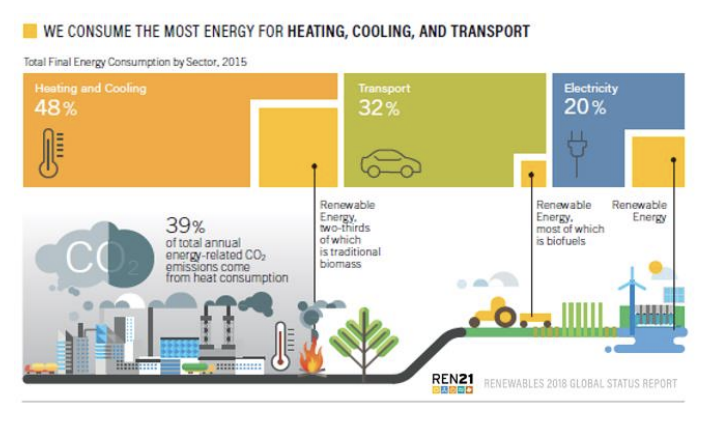 Little change in renewables uptake in heating and cooling: Modern renewable energy supplied approximately 10% of total global heat production in 2015. National targets for renewable energy in heating and cooling exist in only 48 countries around the world, whereas 146 countries have targets for renewable energy in the power sector. Small changes are under way. In India, for example, installations of solar thermal collectors rose approximately 25% in 2017 as compared to 2016. China aims to have 2% of the cooling loads of its buildings come from solar thermal energy by 2020. In transport, increasing electrification is offering possibilities for renewable energy uptake despite the dominance of fossil fuels: More than 30 million two- and three-wheeled electric vehicles are being added to the world’s roads every year, and 1.2 million passenger electric cars were sold in 2017, up about 58% from 2016. Electricity provides 1.3% of transport energy needs, of which about one-quarter is renewable, and biofuels provide 2.9%. Overall, however, 92% of transport energy demand continues to be met by oil, and only 42 countries have national targets for the use of renewable energy in transport.